Once we stepped into the trees enough to not be spotted on the road, I lit the torch. It burned amazingly well and bright, but here’s the shocker: You can’t see much with a torch in the woods. First of all, you have to hold the torch well away from your vision or it’s too bright for your eyes. Also, you can’t see but a few trees ahead of yourself. I noticed the wood underneath the torch head started to catch fire so I spread mud over that part. We walked and managed well. There’s a problem with many forests on Delmarva; they are mainly made up one tree type, since the forests have all been logged and these are new trees. This tree, the loblolly, is has roots that are poisonous to many other plants and make the ground unfit for many other plants, except briars. This is why it’s so hard to navagate through Delmarvan woods, with such dense thorns. And, for us, we had to be sure not to light any tall or hanging briars on fire. After walking for a fair amount of time, we came to an open field. The field was flat with frost sparkling on the vegetation. If there were crops on it, they had been long since harvested. We noted that we entered from the north-east corner of the field, and decided to keep with our route and head for the tree line just ahead, keeping with our perceived west/south-west bearing. But, just then, the head to my torch fell off. That was kind of funny because it suddenly just popped off. It turned out, despite my efforts, the wood was burning just underneath the cloth. As we planned, I dug a hole with my axe and fully buried the flames. We tried to light the other torch but found that I had already burned it at my parents’ house before to the point that it was spent. From there, I carried a candle which was even more worthless than the torch. The party headed through the woods again and noted a shallow creek. It was more like a dry ditch but since we thought we walked far enough, that place would be our temporary camp. Finding a fallen tree to use as a bench, we set up 3 candles on tree stumps around us and broke into the rations. The verdict on hardtack is that it’s not all that bad, but your jaw gets tired quickly. To help it along, we popped the cork for the medieval honey mead and poured some on the crackers to soften them up. Also, putting them over candle flame warms them up and gives them a more cooked taste. The mead was good, but since I was supposedly driving once we got back, I only had a few swigs. Buff doesn’t like fruity drinks so she had even less than me. That meant Joseph had to down the bulk of it, which he quickly did. With the amazing feat of all of our rations being eaten, we gathered the candles, going solely by moonlight then, and headed back. We made a line straight south for the field, which jutted out there (see the illustrations for a better idea). We turned the corner which opened up to the area where we buried that torch head. On that corner we noted a very hand-crafted deer stand with a metal contruction ladder leading up to it. Heading back to that north-east corner from which we entered the field, we tried to head north-east, which meant turning somewhat left. We walked and walked and walked to the point that we knew we had messed something up, because we found no road, no anything but more woods. We decided to fan out a little bit, keeping within close earshot of each other, with Buff in the middle and us guys on each end. I spotted some clearing and had Buff hold my cloak, since the cloaks slowed us down through the briars. What I found out was that while the cloaks slowed us down, it also kept us from getting scratches all over our arms, of which after that point I had plenty. I made my way to a field just as Joseph did, with Buff short behind. We looked at each other concerned, and said what was on both of our minds, “This is the same field from before, isn’t it?” The deer stand mentioned above confirmed our fears. It turned out that in the effort to head north-east at the corner of the field, we kept on turning left. 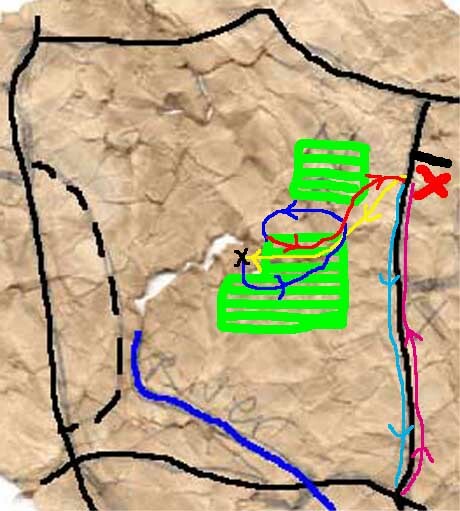 We turned left so much that we constantly changed direction until we re-entered the field from the north-west corner. With nervous chuckles, helped by Joseph being rather buzzed at that point, we collected ourselves and reviewed how we should go about getting out. The moon that we noted on our backs while heading in, had then risen to a point directly above us. We needed a different approach. From the north-east corner of the field, we saw that the constellation Orion was about 15 degrees to the right of the direction from which we entered. We decided to keep Orion in sight and constantly adjust our direction with that. It seemed to work but more bad news struck: we found another field, but at least it wasn’t the same field we just came from. Without heeding the field, we stuck with the bearing that Orion gave us. Right down our path we noted some empty hunters’ campers and this lead to a dirt road. This point brought us to analyze some unknowns. We saw some campers in our pretrip days before during the daytime, but we didn’t see them that night while heading north on the dirt road to where we parked the car. That must have meant that we should head right (meaning south) to find the car. But, that’s only if this was the dirt road where the car was. We had made grave navigational errors already that night. For all we knew, we could have been on that ellusive Heather Road, noted by the dotted line to the west. Plus, this dirt road didn’t exactly look like the one we rode on before. It looked too tight with hardly any shoulder room, comparitively. We drew these map scenarios on the dirt road to help us think it all through. It was 3am at this point and we had to do something to at least figure out which road we were on, if not get back to the car. So we walked to the right on the road. If we didn’t find the car, then at least we could find a street sign at an intersection to help us locate ourselves. We walked and walked and walked. About 20 minutes down the road I noted a chest-high lump of dirt just to the side of the road. I recognized it from the drive up and that the car should be north of here, in the opposite direction that we were walking. Still, if we were going to second guess ourselves before actually finding out for sure where we were, we would never find our way back. So we walked again for at least another 20 minutes before comming to an intersection. The road showed us that scenario we drafted up before was quite correct except for one thing. We did find the correct dirt road and we were actually heading south. We were wrong on the idea that those hunter campers were north of the car, when they were actually south. It was damn near 4am and we were all tired. Joseph had to be at work in Ocean City at 10am and while we were all tired, time was an issue. It would take forever for all of us to walk to the car, since it took us at least 45 minutes to get down from the campers, so I volunteered, for the sake of time, to run back alone. I slipped off my jeans but kept on my sweat pants, took off my boots, threw off my cloak and borrowed one of Joseph’s long sleeve shirts. Those two insisted on bring each their cell phone, and we weren’t playing around anymore, so I took Buff’s phone for communication. I ran, wearing only socks on the dirt road, breathing into my sleeve to keep my face warm. The time went by pretty quickly for me, but those two had a small scare. Some animal made a sound, the closest animal contact we had all night, which freaked Buff out a little. Joseph knew that if she started freaking out, he would freak out at well, so he calmed her down and tried calling me. I got a ring but not enough reception to answer at first, which didn’t help the freaking out situation at all. We eventually connected and I said I didn’t hear anything in the woods. Crisis averted. When I got to the entrance of the campers, I stopped for a moment and looked around. I noted the drawn maps in the dirt on the ground and then looked up the road some, towards north. At the end of my vision I could barely see a clearing opening on the right of the dirt road. I investigated and lo-and-behold it was where the car was. We had missed the car by no more than 50 meters. And, amazingly, considering how bad we got turned around during the first attempt at leaving, we hit the dirt road no more than 20 meters away from where we left it. I got Joseph and Buff, dropped Buff off in Pocomoke city and got back to Salisbury nearing 5am. It turns out that our starting point was a far ways more north than where we thought it was. 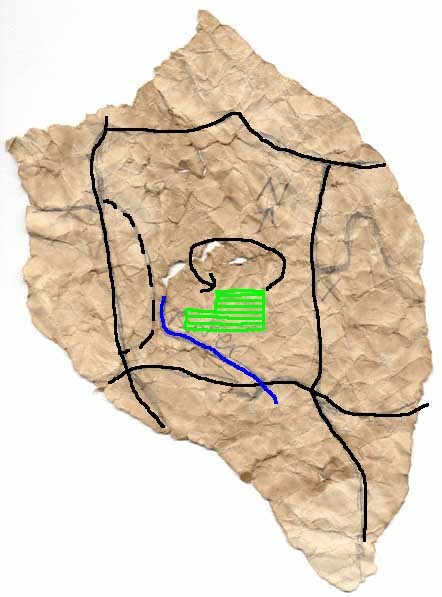 I adjusted the map below to show a more northern starting point. I added guesses to where the fields were and where we traveled. Each color represents a different leg of the journey. The black X at the end of the yellow path is the resting site. Great story, or rather non-fiction! I bet with a little time, you could set up a camp for Ultima fans and do the same thing. You could call it “Cultima”. How long did the torch actually last from beginning to end? I would have been concerned that it would have only lasted like twenty minutes or so. It sounds like it lasted longer though. And the real surprise must have been that head coming off! It makes perfect sense, but it would have thrown me too a bit. Final thing (this is just a bit of an observation here), when you were describing the sky and Orion, I couldn’t help but think of Drakken. Maybe you should run a Drakken outing next. Oh hell no, I didn’t even want to think about constellations attacking me or that crappy game. Although I’ll always have a place in my heart for Anak. I can’t really say how long the torch lasted or rather how long the wood below the head lasted. Many a detail from that night are just hazy. I’m not sure we even checked the time until we got to the road. Either way, the only times that I remember are from that point on. If the torch had a base that would have actually lasted, I swear that it could have lasted tons longer. There had to have been a good 12 layers to that thing and it hadn’t even burned all the way through the first. Drakken – LOL. That game is horrible. Did anybody ever beat it?